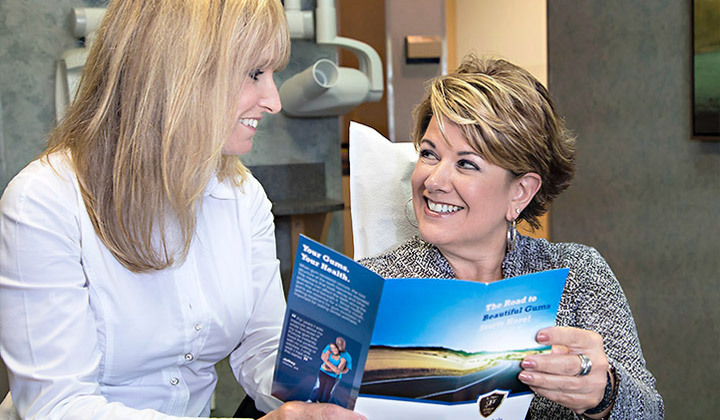 We educate our patients about gum disease and the available treatments. Gum disease, or periodontal disease is an inflammation of the gums that can progress to affect the surrounding structures of the teeth. The inflammation is caused by a bacterial infection that results from the accumulation of dental plaque—a sticky, colorless biofilm of bacteria and sugars—around the tooth. 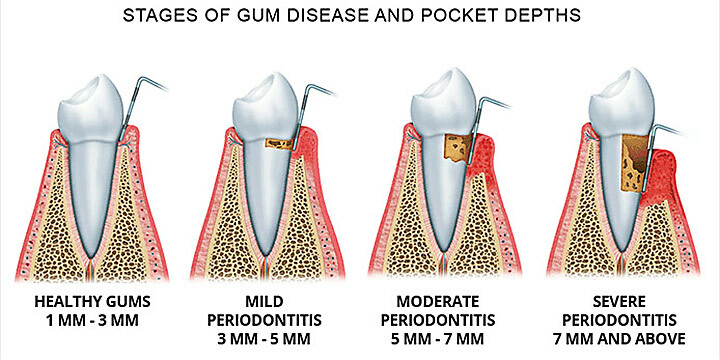 Gum disease can range from simple gum inflammation (gingivitis) to a more serious condition (periodontitis) that can result in damage to the gums, tissue and bones that support the teeth. If the disease is allowed to progress, the teeth become loose and are often lost. According to the U.S. Surgeon General, gum disease affects 85 percent of Americans age 18 and older. It is a particularly insidious disease because it often shows little or no symptoms in the early stage of the disease. Since the disease can progress without pain or discomfort until it becomes severe, it often goes untreated until it is too late. Gum disease is the leading cause of tooth loss. 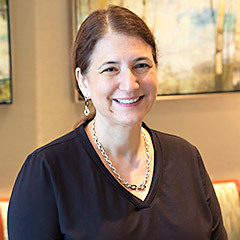 As a periodontist, Dr. Perlman is a highly skilled specialist in the diagnosis, treatment and prevention of gum disease. Using the latest in dental technology, Dr. Perlman can restore your oral health by removing the disease-causing bacteria. His main objective is to save your teeth, heal your gums and maintain your dental health. Read more about Dr. Perlman’s Gum Disease Treatment. The mouth is home to entire colonies of bacteria. Most of these bacterial species are harmless while others help to protect the teeth and gums or play an important part in the digestive process. Trouble starts when certain bacterial strains accumulate on the teeth in the sticky, colorless biofilm known as plaque. The bacterial plaque emits toxins that irritate and eat away at the gums and tooth enamel. The gums become inflamed. This is the beginning stage of gum disease. If this accumulation is not removed, the disease progresses in severity as the plaque accumulates further. 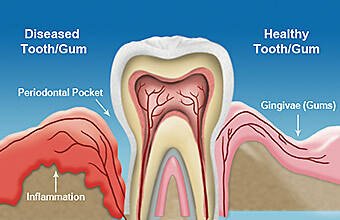 This causes the gum to begin to detach from the tooth and form a “pocket”. The plaque in the pocket hardens into a crust called tartar or calculus. The tartar serves as a trap for further plaque accumulation. If left untreated, the pocket will continue to deepen, the inflammation will worsen, the gum will detach from the teeth and the supporting bone will be lost. Gingivitis is the inflammation of the gums and is the earliest stage of periodontal disease. Plaque buildup is the main culprit as it produces toxins that irritate the gums, causing redness, swelling and bleeding. If gingivitis is left untreated, the infection will advance to periodontitis, which is an infection of the gums and surrounding tissue and bone. With time, plaque will spread and grow below the gum line. As the disease progresses, bacteria accumulates and hardens into calculus (also known as tartar). This irritates the gums further and accelerates the infection, gum detachment and bone loss. Eventually, teeth can become loose and may have to be removed. The point of gum attachment to your teeth is naturally about 3mm below the visible gumline. Gingivitis can exist at up to 3mm depth, but there is no loss of ligament and supporting bone. Periodontitis has set in when the point of attachment below the visible gumline is greater than 3mm and the ligaments and bone have started to erode. Periodontitis progresses in three stages: mild, moderate and severe. Dr. Perlman can ascertain the extent of periodontitis by doing a pocket probe, gently measuring the depth of your gum pockets using a small probe. If gingivitis is left untreated, it can advance to periodontitis. In the early stages, periodontal disease begins to destroy the bone and tissue that supports the teeth. At this stage, the destruction of the supporting bone and tissue has continued and the gum continues to fall away from the tooth. In the most advanced form of gum disease there is extensive bone loss and tissue damage. Teeth often become loose and may have to be removed. Pocket depth is 7 mm or above. The depth of a tooth root is only 10-12 mm, so at this level the tooth is in severe danger. Dr. Perlman explains the different warning signs that may indicate the presence of gum disease. It’s important to note that gum disease can progress without pain or discomfort. If you have any of the following symptoms, please get in touch with our office. 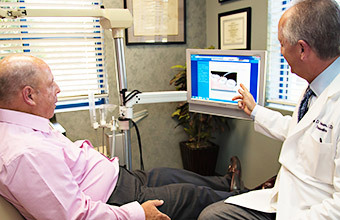 We will help you determine the state of your teeth and gums. Plaque accumulation and the resulting infection and inflammation are the principal cause of gum disease. There are other factors that can make the disease progress faster. Poor diet: Lack of proper nutrition may cause chronic adverse conditions, including gum disease. A well balanced diet, featuring fresh fruits and vegetables, can boost nutritional levels. Genetics: An estimated 50% of people are predisposed to gum disease. However, proper oral care can keep the disease at bay. Systemic health problems: Health problems such as diabetes, respiratory disease, heart disease, and autoimmune disorders may contribute to gum disease. Smoking: Need another reason to quit? A recent study indicates that the most damaging types of bacteria for gum health are found in the mouths of smokers. Poor quality dental work: Bacteria can accumulate beneath poorly fitting bridges or crowns. Female hormonal changes: Hormonal changes can sometimes make the gums more sensitive and make it easier for gum disease to develop. If you are concerned that you may have gum disease or that earlier treatment has not gotten your periodontitis under control, visit Dr. Perlman for a consultation. 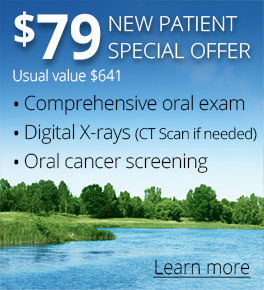 He will examine your teeth and gums and determine the extent of your gum disease. He will then advise you on the best way to treat and control your gum disease or prevent future recurrence.